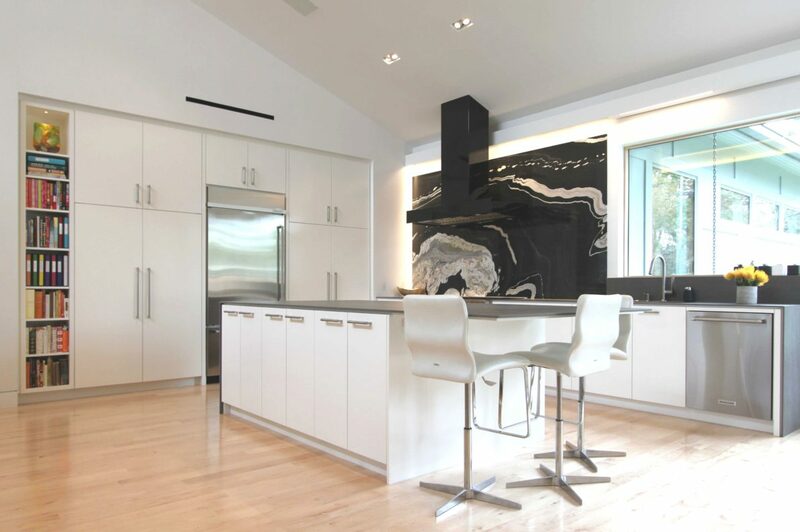 The kitchen is clean, open and full-featured. 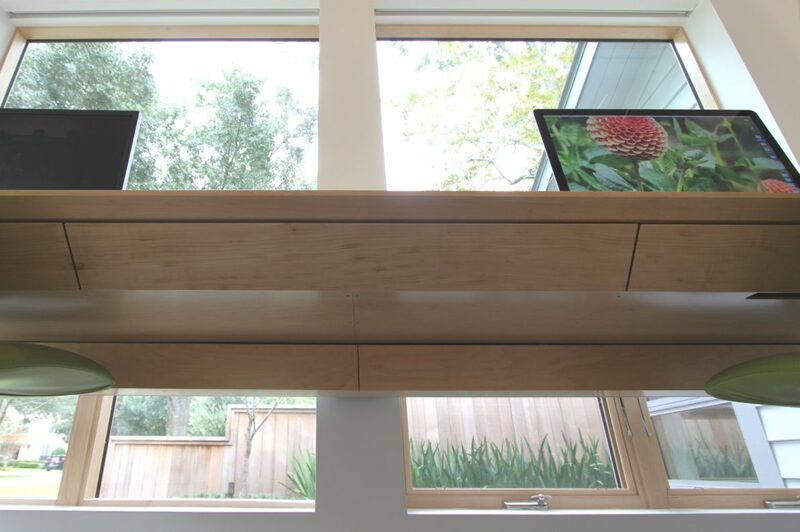 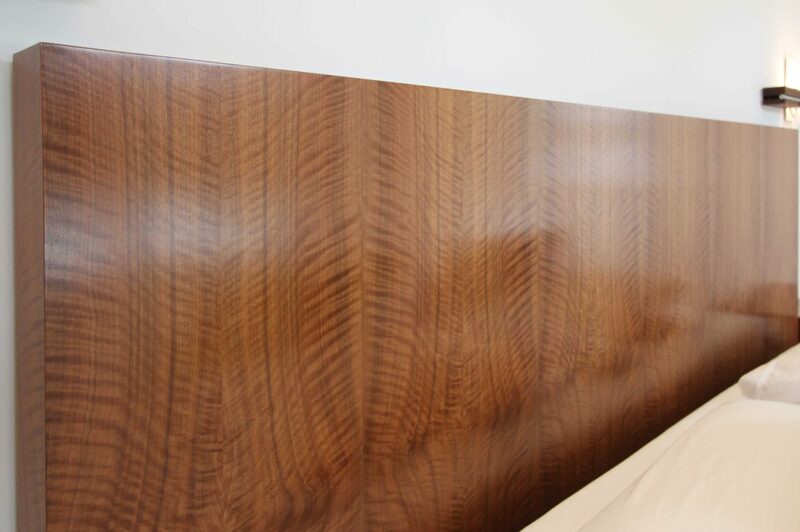 The cabinet exteriors are finished with a premium clear-coat catalyzed finish. 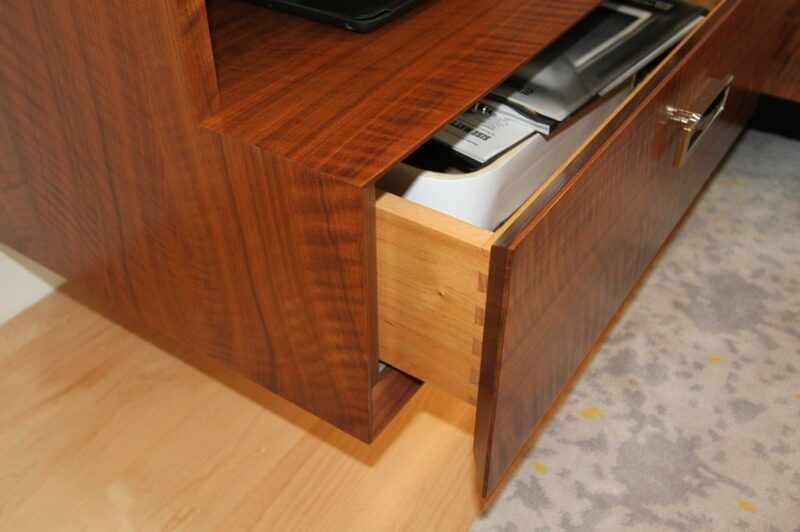 The doors and drawer fronts look molded. 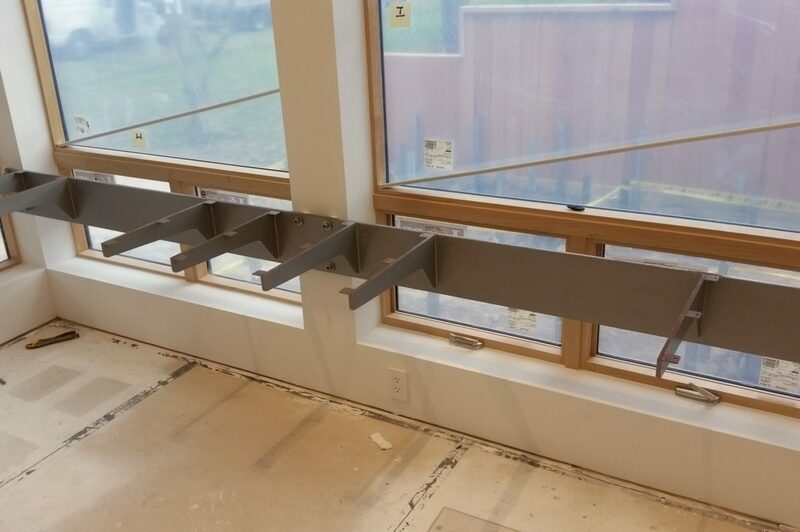 The splash behind the range is a huge piece of stone mounted to the wall before we installed our cabinets. 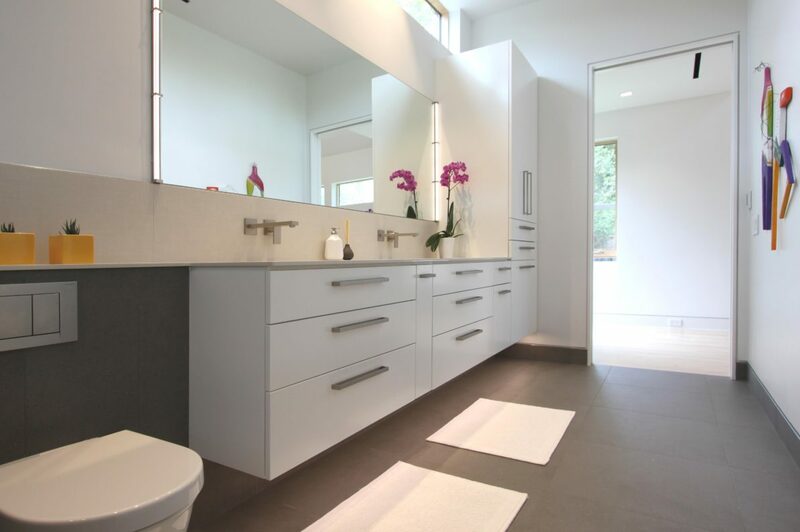 The porcelain counters are ½” NeoLith. 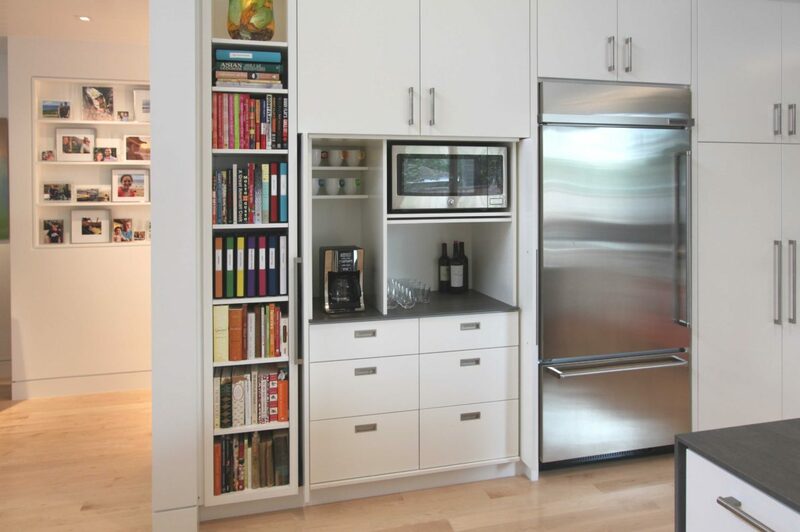 The pocket doors to the right of the bookcase hide the coffee bar. 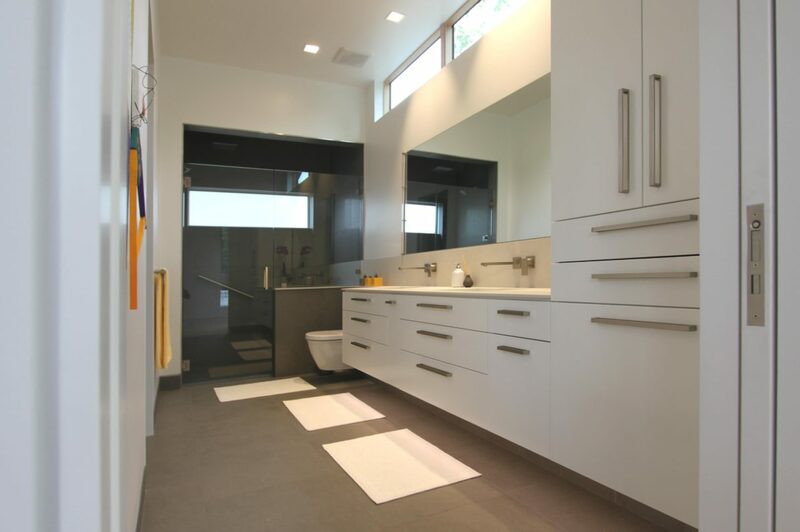 Notice that the doors line up perfectly. 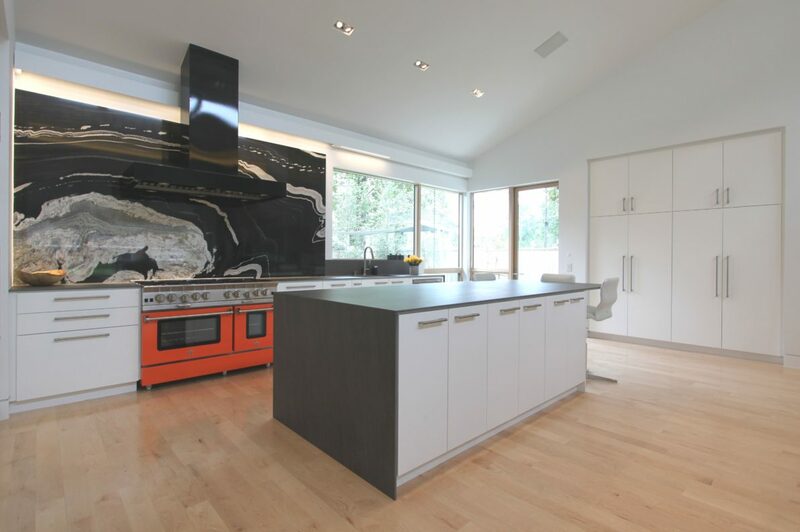 The waterfall counter detail on the island is front and centered in this photo. 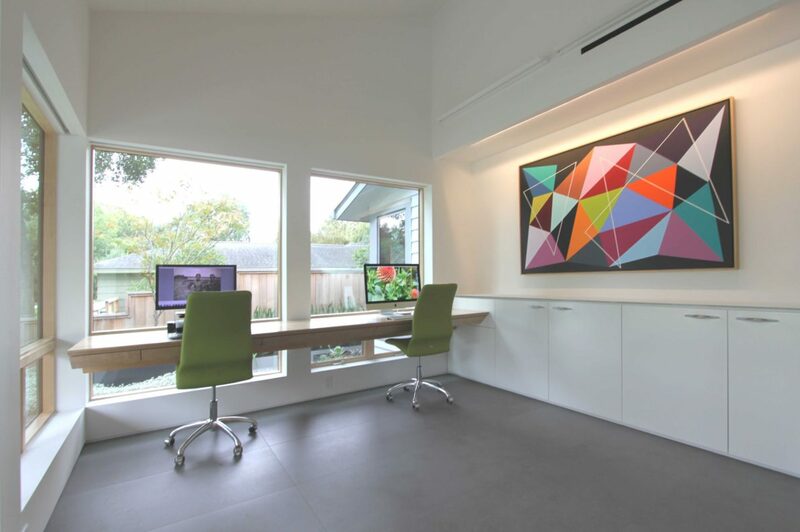 The bright red range is not the place where you usually see a splash of color added. 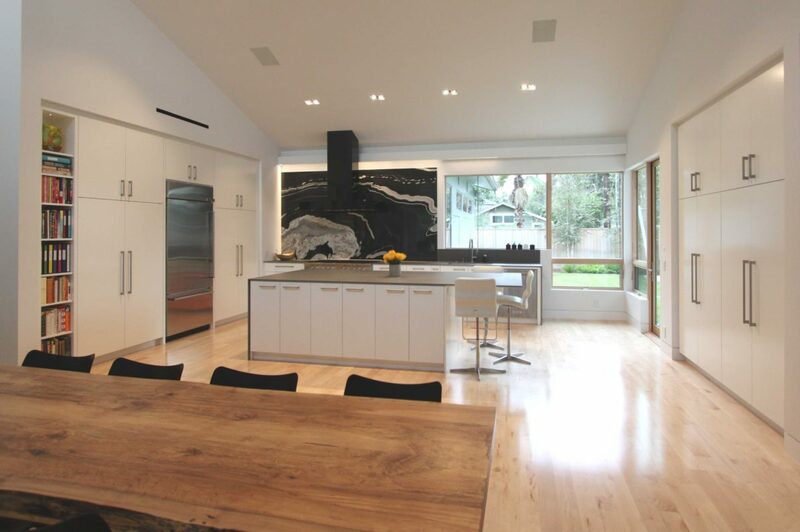 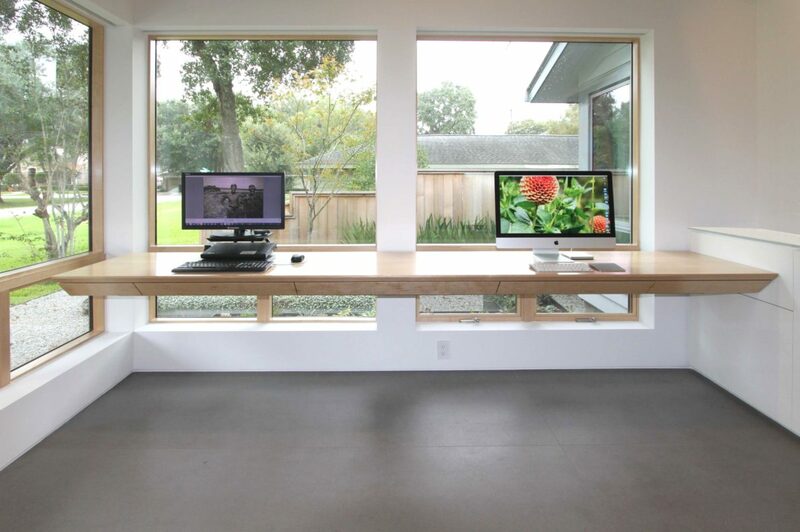 The 30” counter overhand on the island is really dramatic. 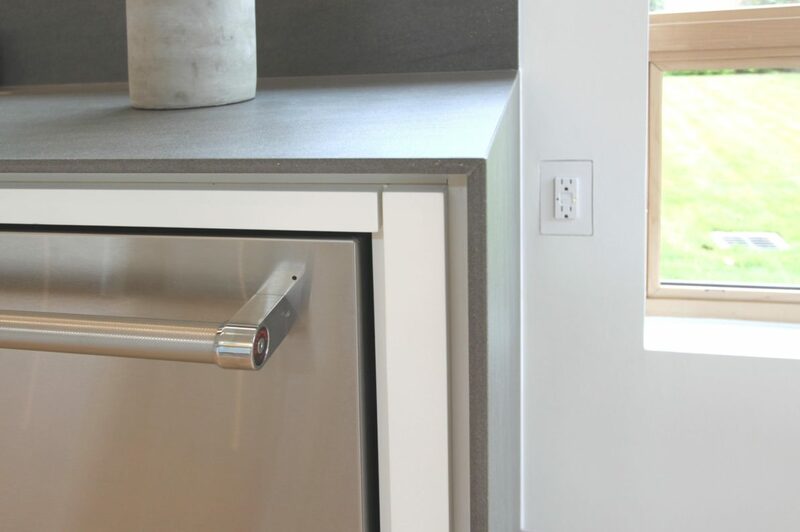 Even the electrical outlets are carefully incorporated into the island design. 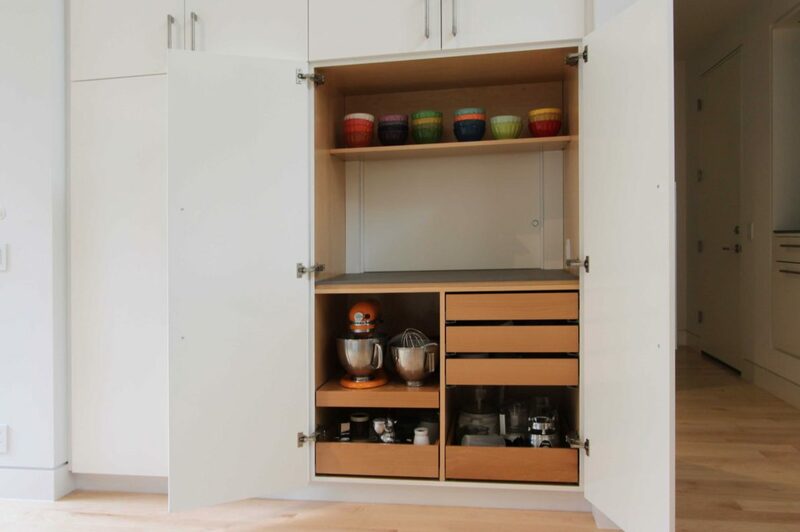 The coffee bar is hidden by a pair of pocket doors. 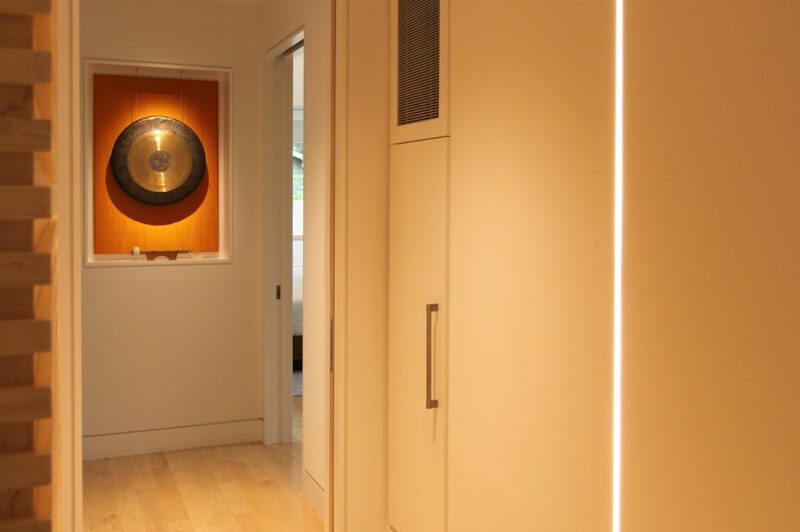 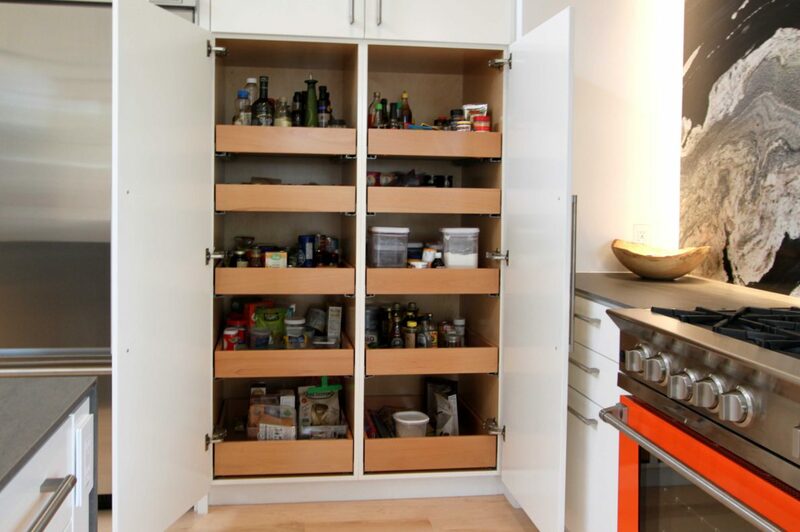 The hardware for the doors is actually recessed into the bookcase and refrigerator end panels. 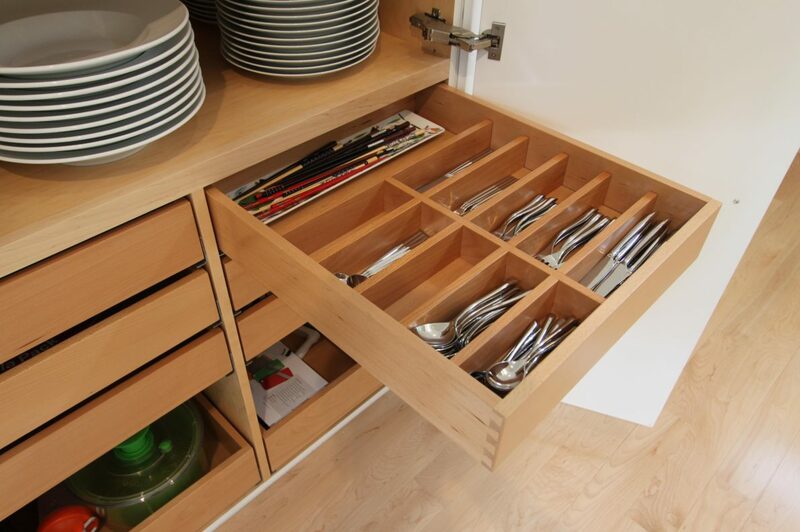 The pantry has extra-deep pull-out trays. 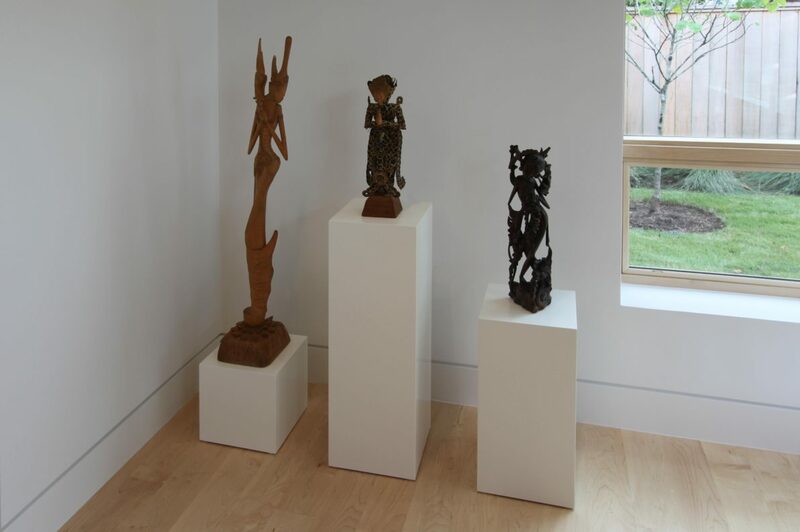 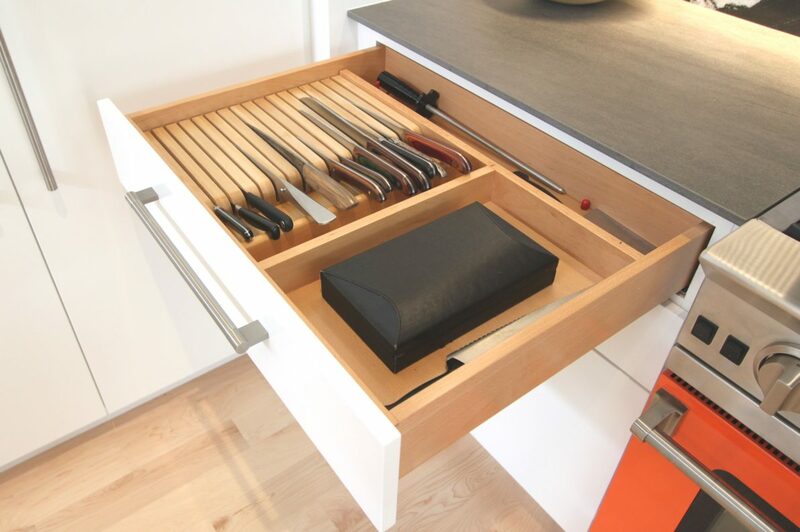 The custom knife block is pictured here. 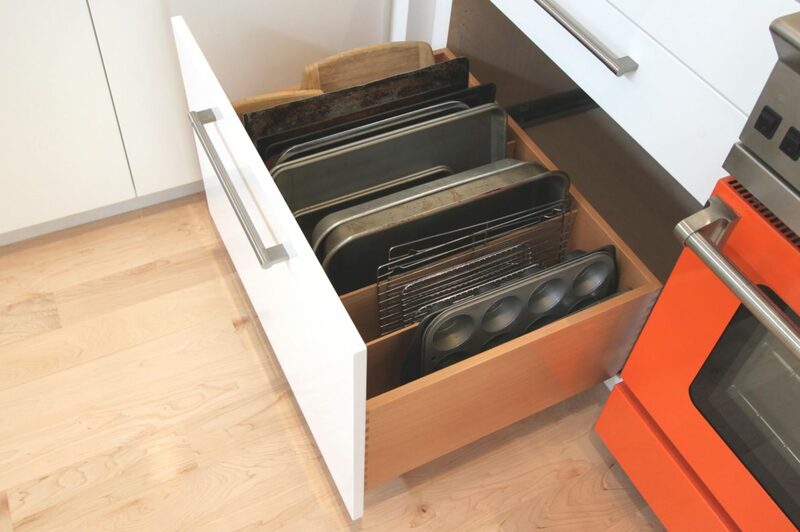 Pans in a dovetail drawer – it really works! 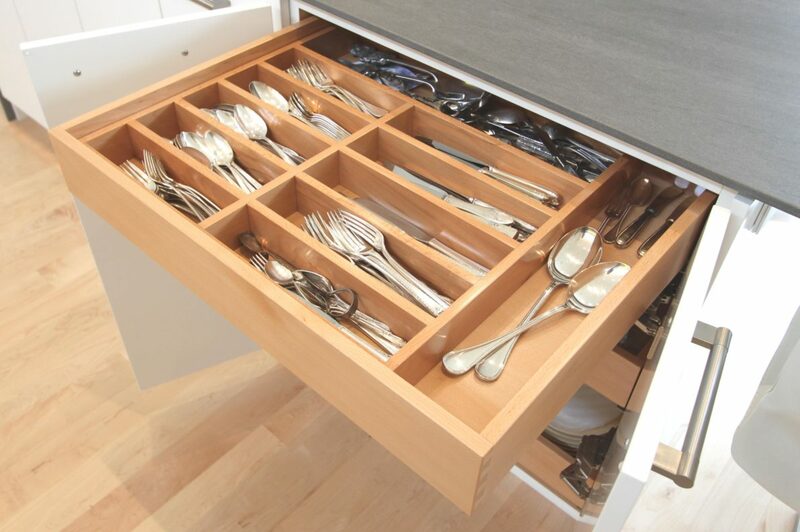 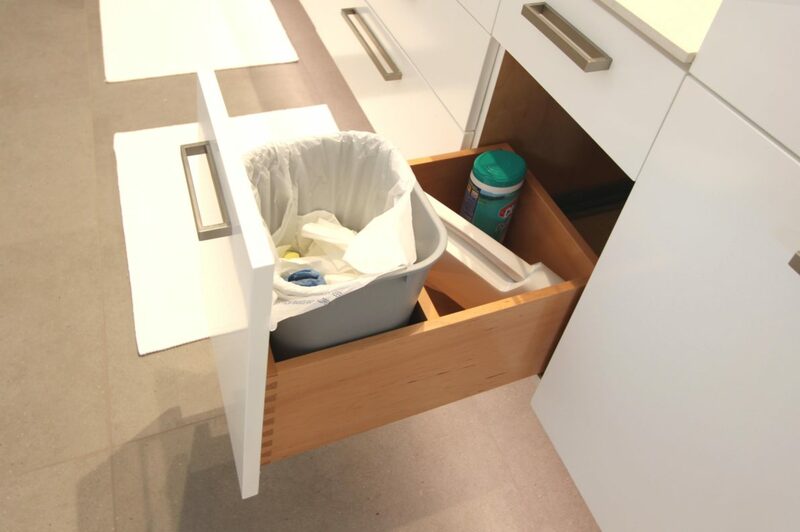 Custom solid beech flatware drawer was sized to meet our client’s needs. 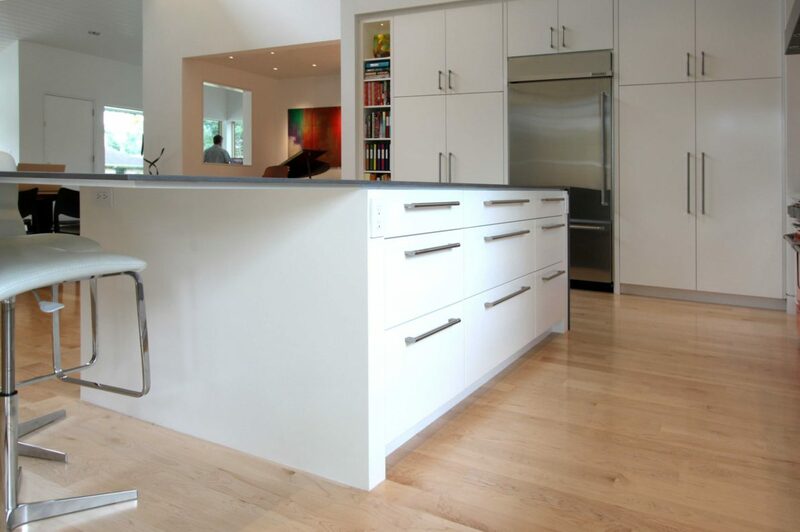 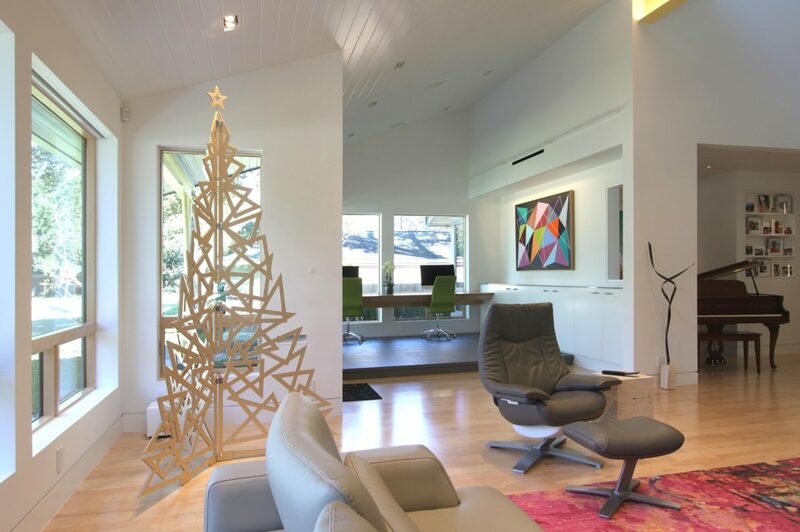 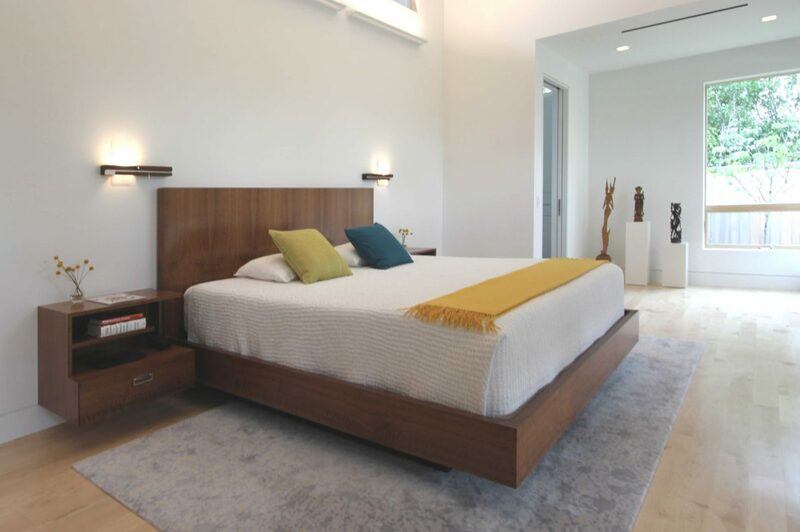 The natural maple interiors is finished with the same catalyzed clear that coats the white painted doors. 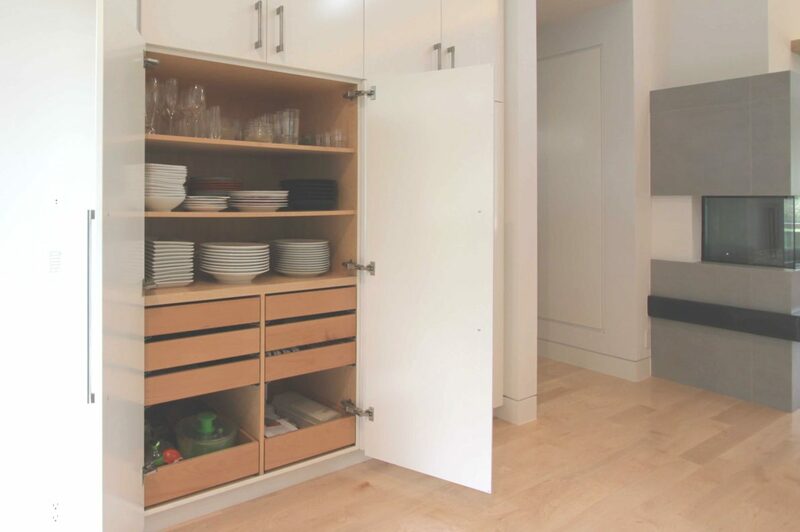 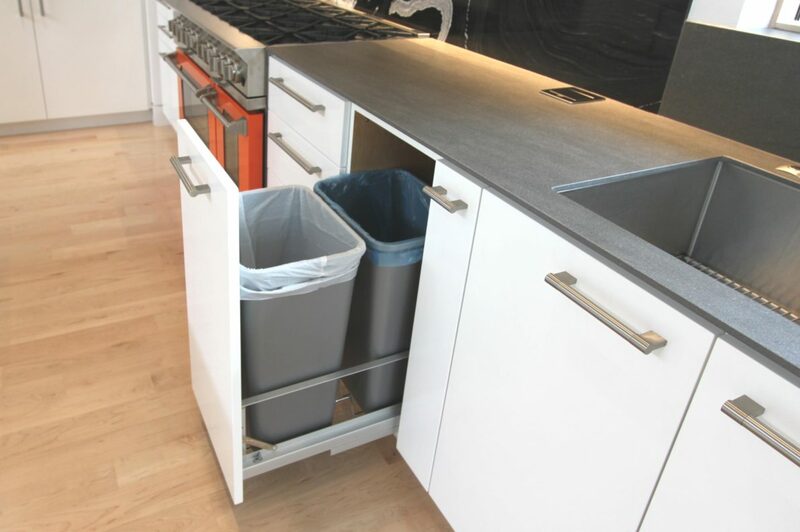 The pass-thru cabinet gives the client a cool way to unload their groceries. 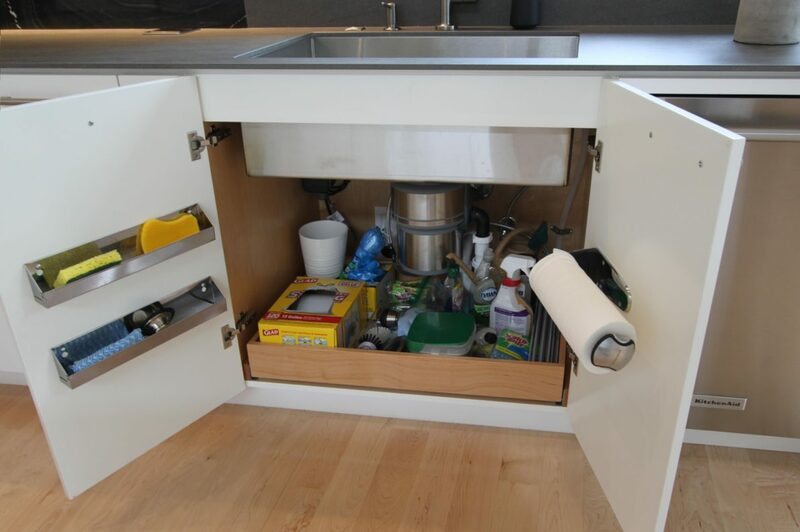 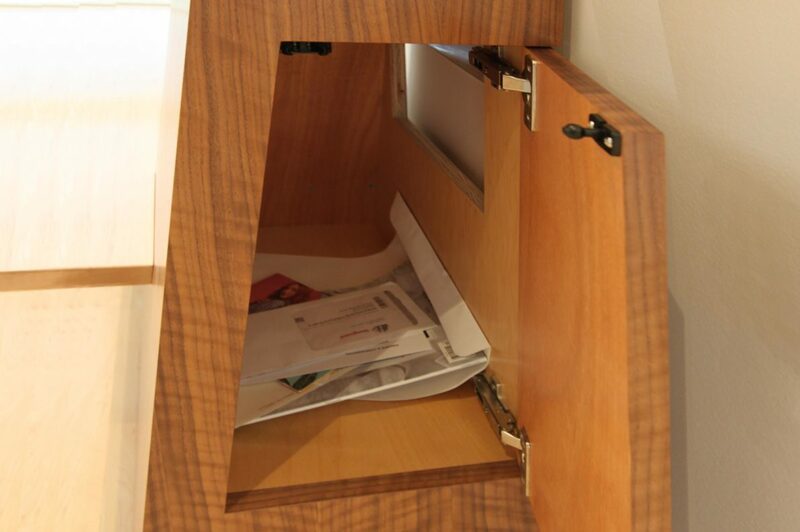 The sliding door mechanism is integrated into the back of our cabinet. 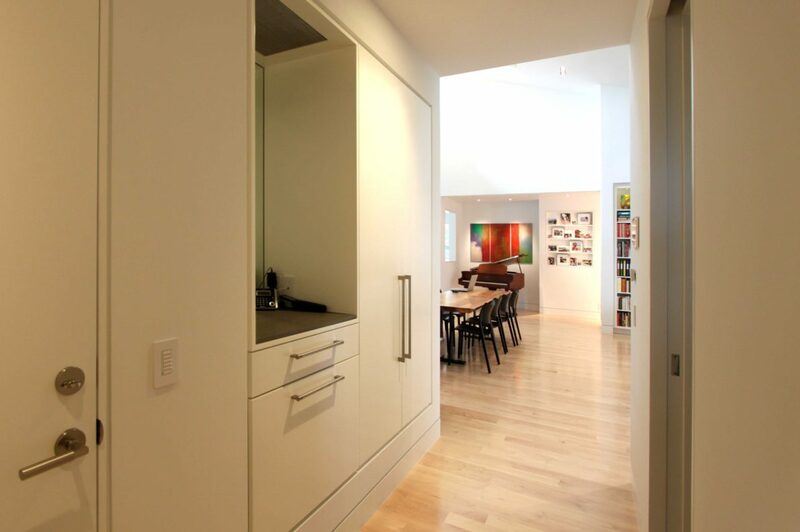 Pass-Thru with sliding door back open to the utility room. 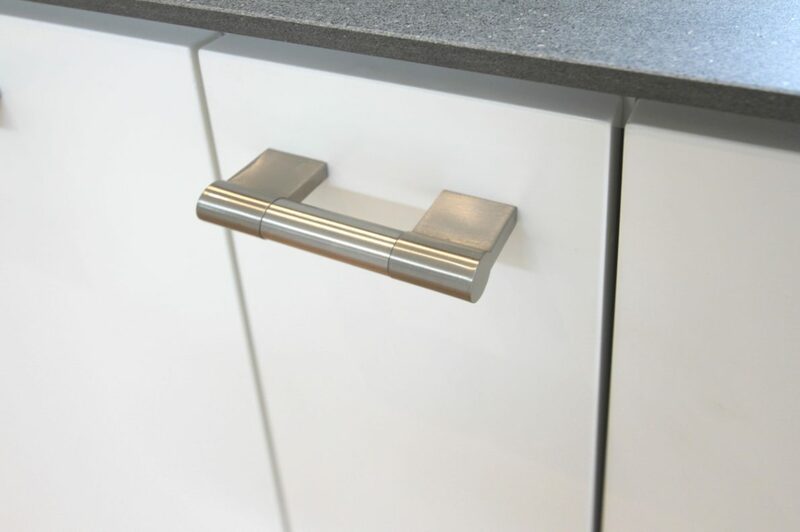 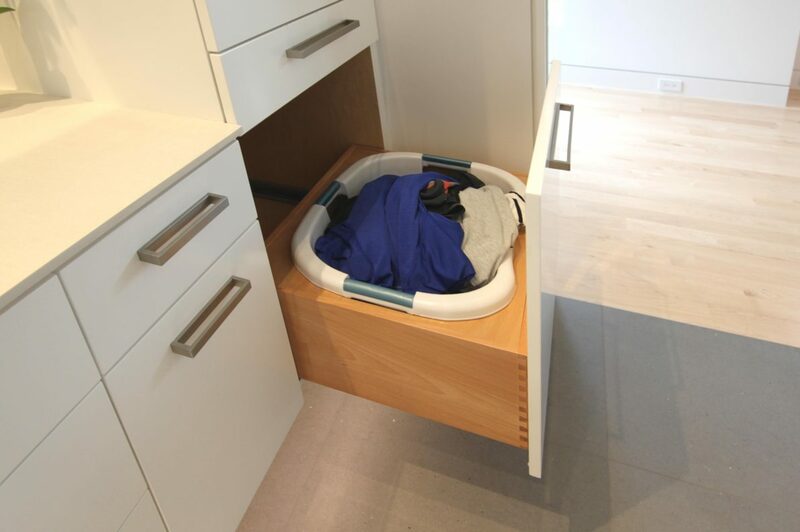 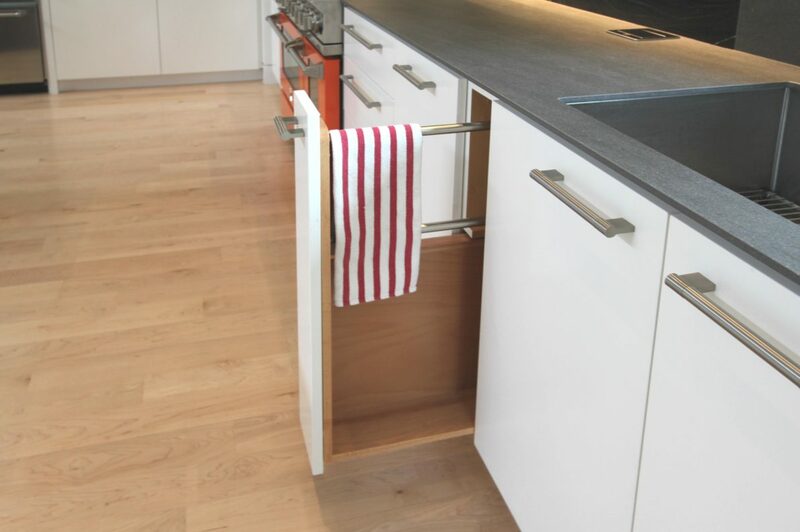 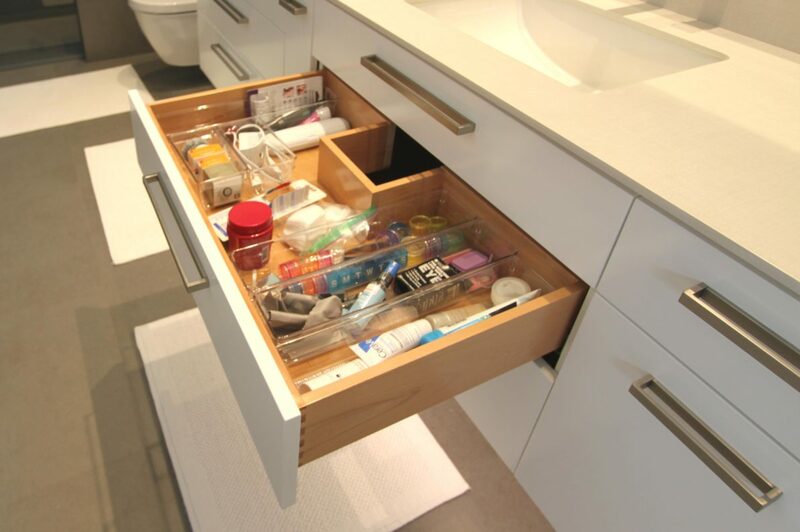 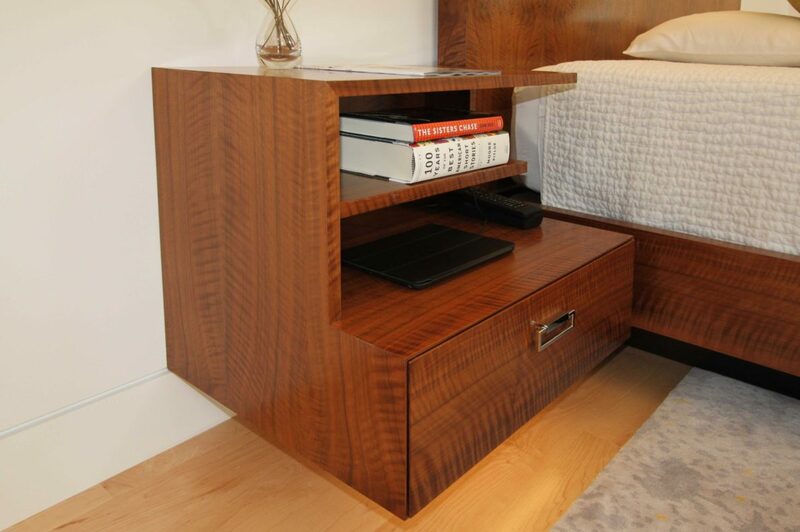 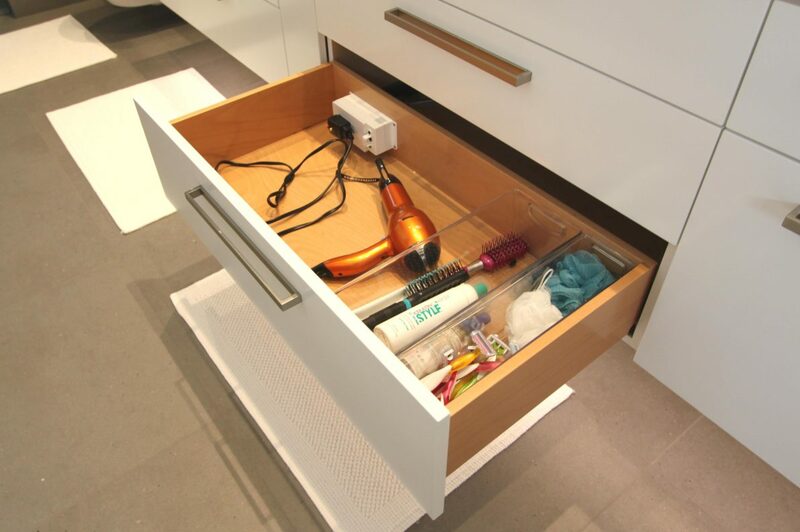 The custom towel rack pull-out is on the same soft-close slides as our drawers. 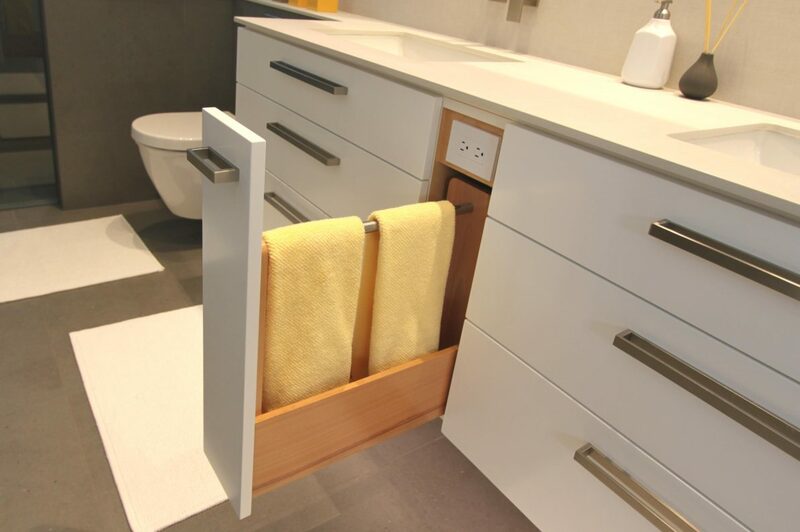 Custom Pull on Towel Pull-out. 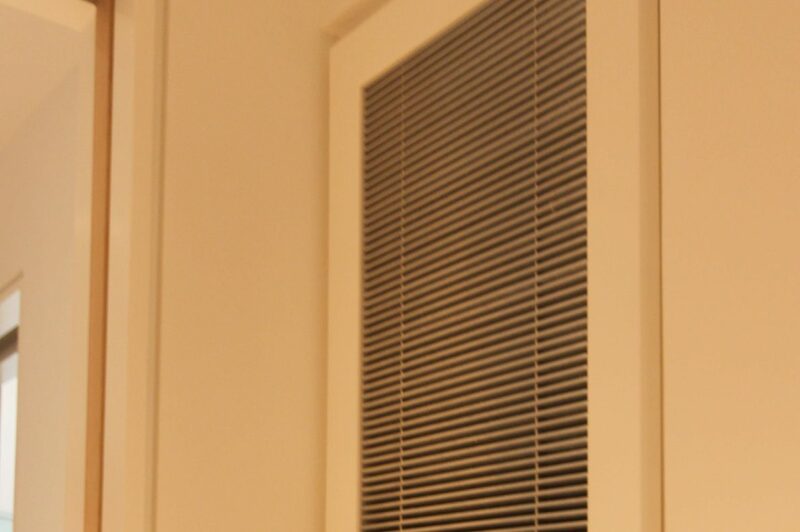 The manufacturer did not make a pull short enough for this tiny door. 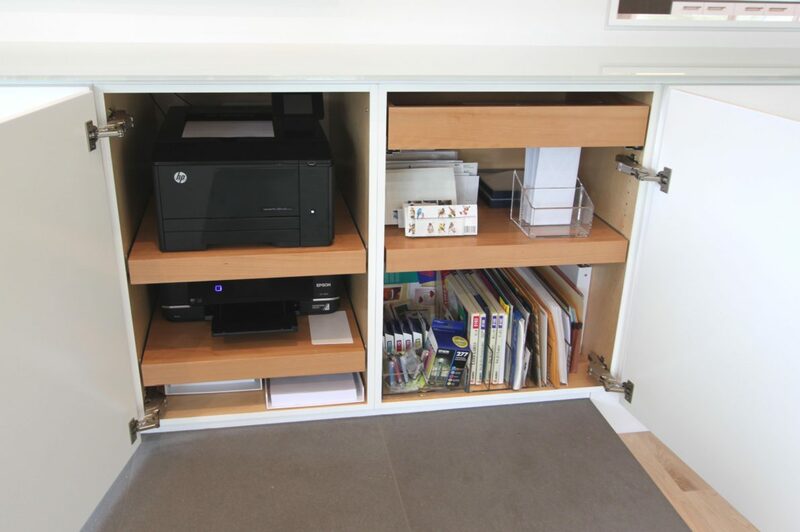 Study Printer cabinet is recessed into the wall. 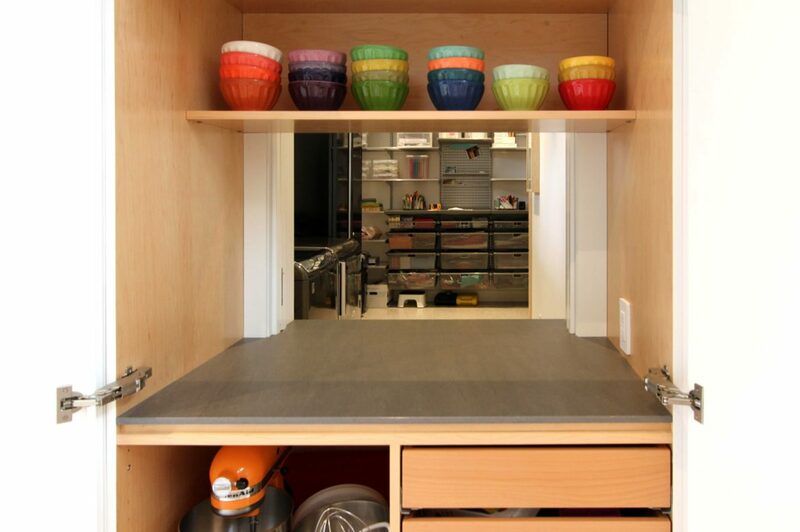 Cantilevered counter with the tub controls incorporated into it. 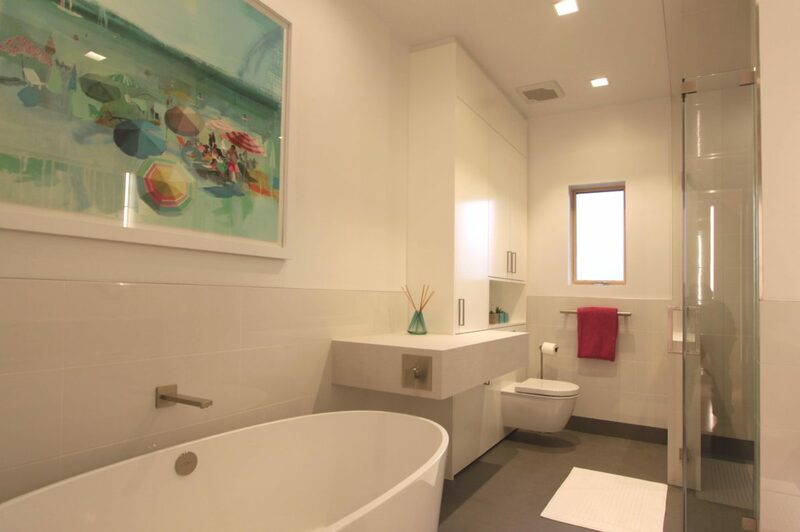 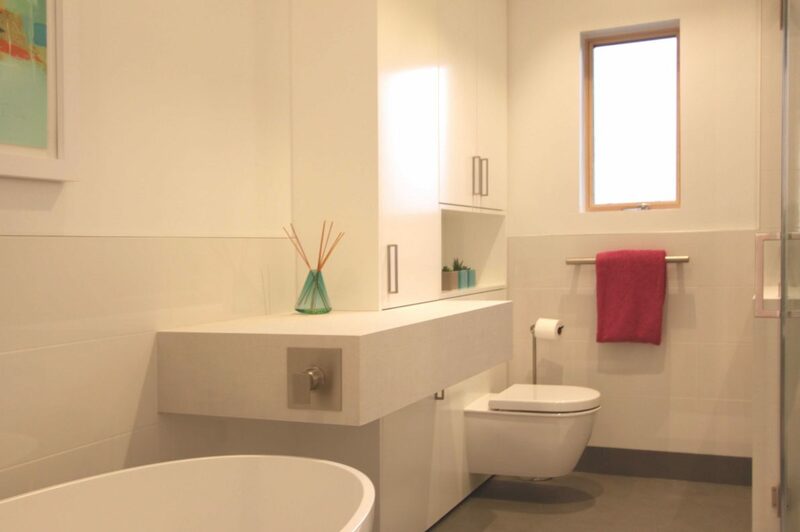 Yes, the toilet is mounted to my cabinetry! 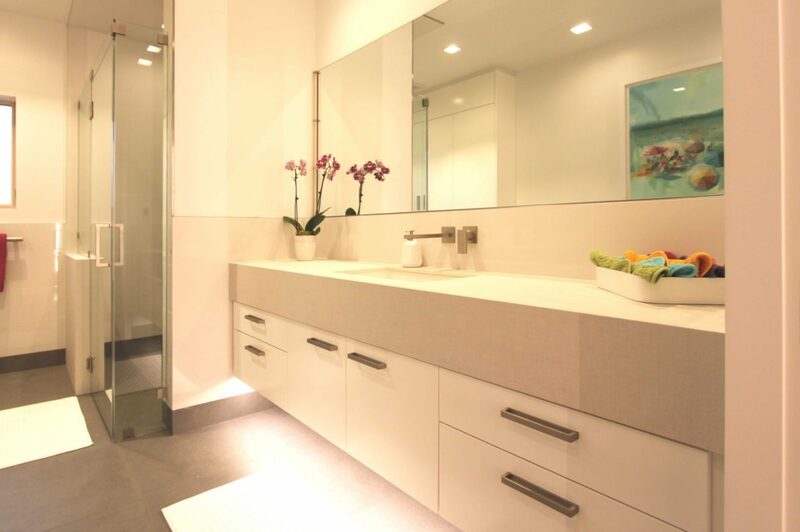 The cantilevered vanity had a tall NeoLith drop-edge counter. 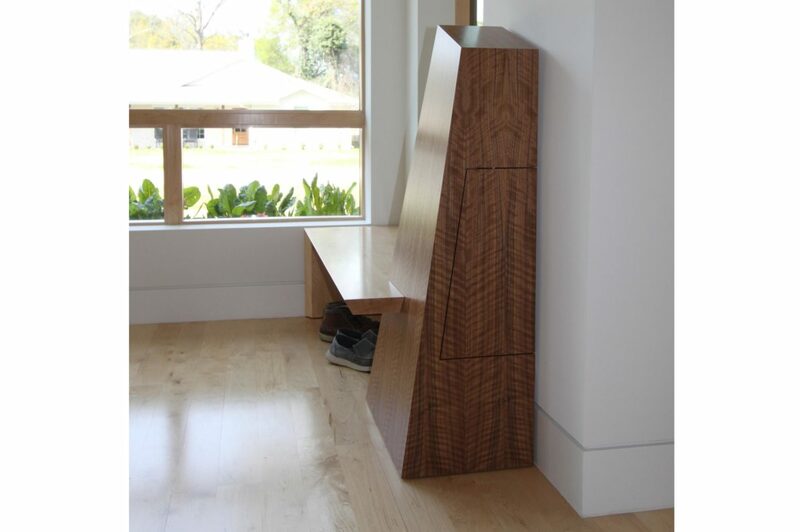 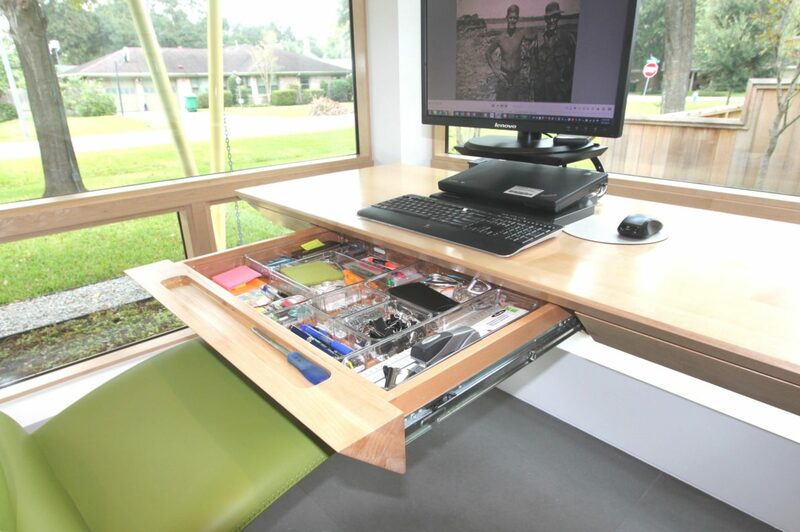 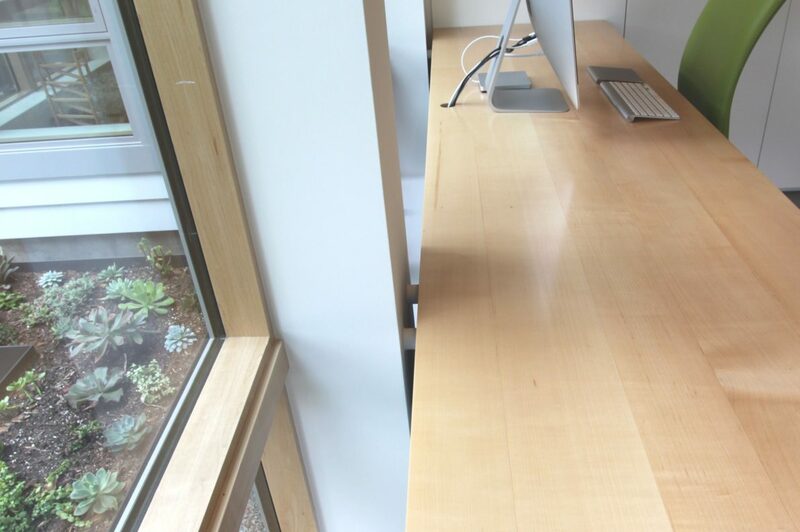 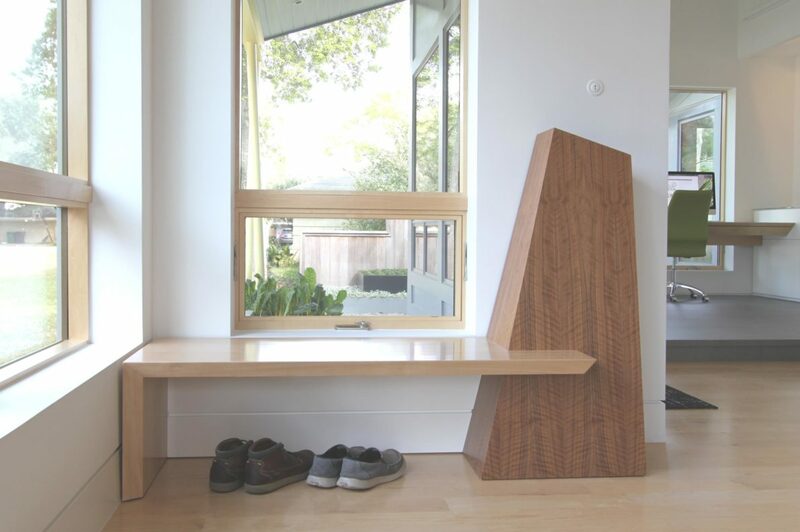 This functional bench / mail cabinet also covers up unsightly wires, plugs, and the subwoofer.